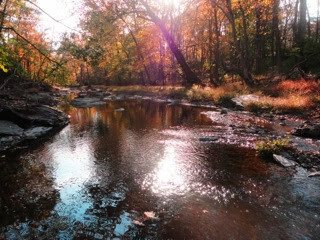 "Sun Through the Foliage on Jacobs Creek"
This is the creek (Jacob's Creek) across from our home. Those of us who live around here are lucky enough to be able to walk across the rocks so we can stand in the middle of the creek to take pictures. I was just catching the sun as it made it's way down for the day.